I consider the phrase “organic foods” mostly a farce and there’s a reason behind it. Since agriculture began, farmers have, for generations after generations, picked the most desirable traits, like the best colour, size, taste etc. Today, the average vegetable or fruit you see in the market is easily labelled organic, as long as it has been grown with certain conditions met. In reality the average fruit or vegetable has gone a drastic change in its genes and has transformed in appearance since back then. So much that you wouldn’t even recognize the old real varieties of fruits if they were placed in front of you. In fact, broccoli didn’t even exist back then. But that is probably fine, because the kind of genetic selection was mostly a slow and natural process with a tiny bit of human intervention when it comes to selecting the best traits. Just like the muscular Belgian cows which aren’t exactly GMOs. 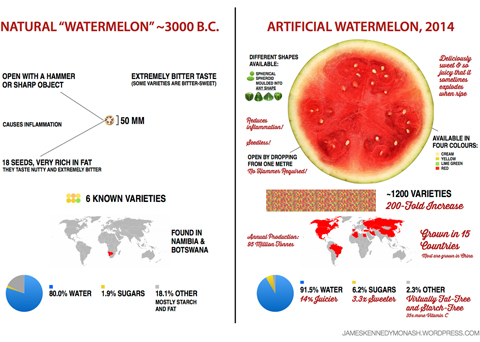 For fun, let’s look at this infographic which shows what a watermelon looked like and what it looks like now, after extensive selection breeding. Okay, like I said, that is mostly natural. But there are not so natural ways that have been figured out to speed up the selection process. Mutations or physical variations in cultivation is where it started. But it was a very slow process. Picking the best traits generation after generation. 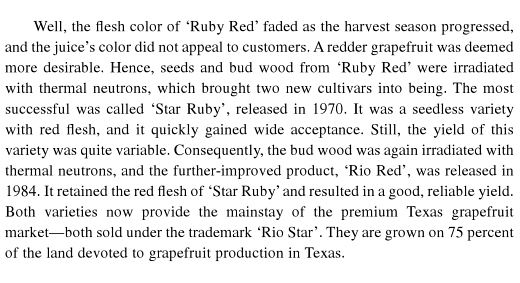 A much faster process of making several kinds of variations emerged in the year 1940. This time, plant breeders approached the tedious problem of selection with a fairly new tool called atomic radiation. Scientists soon found that when plants were exposed to radiation, it would damage (or simply scramble) the DNA and would cause a random mutation every time. This approach helped them generate a vast number of random, good and bad mutations at a much higher rate than the natural way. And larger number of variants meant, larger probability of finding the most desirable state very fast. We no longer had to wait for generations. Thousands of variants produced by this kind of mutation breeding, either by radiation like gamma rays, thermal neutrons, X-rays or by exposure to certain chemicals have been recorded in the government’s database at – IAEA. Although I’m not suggesting that it is dangerous to eat these kind of fruits and vegetables, I’m making a point that the whole organic food industry is a farce designed to make your pockets lighter. Crops produced through this kind of mutation breeding has been sold safely in every supermarket store today. No labels whatsoever are placed on them that mention these unnatural genetic alterations that were done to create the delicious fruit of the day. These are even be labelled organic when they are grown with organic food production requirements. They need not undergo any separate testing. But is clearly not very organic when you consider its genetic origin. I don’t for a moment buy into the idea that mutant foods are not dangerous to your health. More people are getting ill and finding that they are more sensitive to foods. mainly grains. And there has been an increase of nut allergies, You F@#k with nature and nature fights back. We humans are getting too arrogant in thinking we can mess with nature and not reap the consequences? There is no guarantee the mutated foods will have the same nutrients or that the mutated foods don’t have other ingredients that create health problems. Especially immune deficiencies. They say that through mutation breeding we get foods that are pest resistant. Chances are if the pests don’t eat it maybe neither should we.